In July 2013, I stood in front of my family’s lake house in Groß Glienicke, a small village west of Berlin. My great-grandfather had built the house in 1927 as a weekend retreat away from his hectic Berlin medical practice, but he - like so many others - had been forced to flee with his family when the Nazis came to power. Since they left, it had been occupied by a number of families, but now it was abandoned and in a terrible condition. Its windows were cracked, its roof was full of holes. Inside was no better: the walls were covered with graffiti and the floors strewn with rubbish. In order to save the house, the local authorities told me, I would have to prove that it was of historical significance. I would have to get to know the local residents, gain their trust, gather their stories about the house and its inhabitants. But how could I, an English writer with a poor grasp of German, embed myself in a small village outside of Berlin over one thousand kilometers from my home? At that time, I only knew one Groß Glienicke resident, Sonja Richter. It had been Sonja who had first alerted me to the lake house’s dilapidated state. From this solitary contact I would have to build a network. On one of my first research trips to Groß Glienicke, Sonja introduced me to Burkhard Radtke, a seventy-five-year-old local historian who had grown up in the property behind my grandfather’s house. Burkhard remembered playing with the children who lived in the lake house after my family left in 1936; he recalled the brutal Soviet army in 1945; and the terrible murders that had shaken the village a few years later. It was also through Sonja that I met eighty-six-year old Günther Wittich, who recalled the evening in November 1938 when a Jewish family’s house was burned down in the village; Wilhelm Stintzing, a 100-year-old former priest, who visited boys and girls in prison after the East German police arrested them for participating in a confirmation ceremony; and Bernd Kühne, who told me what it was like living at the lake house in the shadow of the Berlin Wall – the concrete barrier was built ten metres from his back door, cutting off access to the lake. Without that first contact, I would have achieved very little. I wouldn’t have encountered the lawyer who helped me to access the Stasi archives and obtain the files of the secret informant who had lived at the lake house. Nor would I have met the botanist who gave me a meticulous tour of the lake, pointing out what species were native and explaining how the flora and fauna had changed over the previous century. These encounters, however, were not without their difficulties. A few people were shy, unwilling to open up their lives. Some provided me with information that contradicted another’s testimony. One local woman sent me forceful emails, insisting that I needed to understand that life during the East German period was not so bad, that the village residents were able to shop, work and carry on a ‘normal life’. The search for the lake house’s final occupant proved most challenging. I knew his name, and where he lived, but couldn’t find a way to speak to him. I posted a message for him on Facebook, I left a note in his letterbox, I spoke to his football coach and employer, I waited in his favourite haunts. All to no avail. I concluded that he was avoiding me. He didn’t have to speak to me – and I should have perhaps respected his privacy. But he held the last pieces of the puzzle – the information that might help me to save the house. When, after six months, my researcher and I were finally able to track him down, catching up to him after a football match, he apologised for his lack of response. There had been no ill-will, he said, he had just been busy. When I offered to pay him in return for his interview he turned down the money. I learned two valuable lessons: tenacity pays off, and don’t jump to conclusions. It has been two years since I stood outside my family’s dilapidated house in Groß Glienicke. Since that time I have become familiar with more than one hundred people in the village and surrounding area. From a single first contact, an entire network of acquaintances has blossomed. 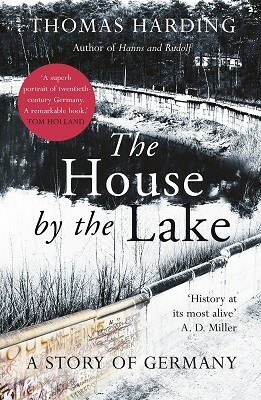 Without their stories I could not have written the The House By The Lake.